Okidoki, so I know this purple-stained pasta isn't the world's most attractive dish, but bear with me because it tastes so good! I made it dish for dinner last Sunday, with lots of leftovers for weekday lunches. I just wanted to use up ingredients I had in the fridge, and was not expecting it to be any good, but it was actually totally awesome! I couldn't stop eating it and thought I wouldn't have any left for the week! The story goes like this: I'd planned on making Nigella's curly pasta with feta, (frozen) spinach and pine nuts - simple but classic combo - but discovered half a bunch of wilting red kale in my vegetable crisper, and thought I should make use of it rather than chucking it out. 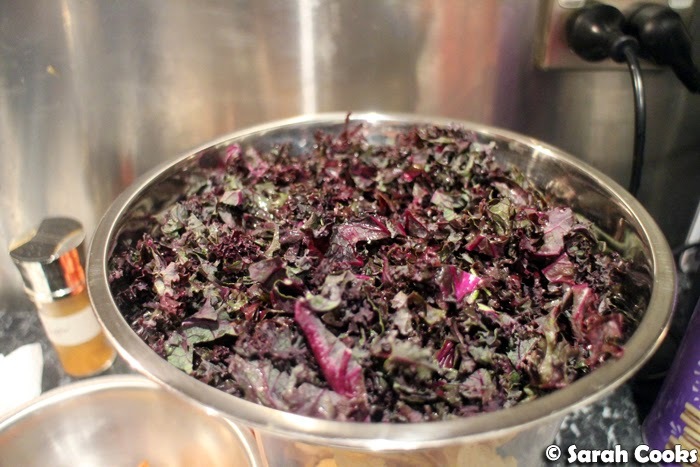 We'd bought it ages ago with grand plans of making kale chips, but never got around to it. Raw red kale kinda looks and smells like silverbeet and chard (two vegetables that I detest), and I was worried the end result would be a bitter mess that I'd be self-sacrificingly eating throughout the week to save money, when what I'd really want would be Nando's or ramen. Luckily, this wasn't the case. I thought I only liked kale when roasted or deep-fried, but turns out that it's nice when sauteed in a pan too! Upon cooking, the red kale goes soft and sweet, marrying fantastically with the creamy melted feta and slightly crunchy buttery pine nuts. (Indeed, if you had some currants I think you could chuck them in once the kale is cooked to amplify the sweetness). Grated parmesan adds a deeply savoury touch. I made the original version once, when I first bought Kitchen, but I think it's even nicer with red kale. I found red kale at my local supermarket, but I'm sure green kale would work well too. As for the pasta, I used this Vetta High Fibre rollini that a PR company sent me - tastes just like regular pasta to me, which is a good thing! With the high fibre pasta and loads of vitamin-rich red kale, I'm thinking this is a pretty nutritious option for weekday lunches that still feels comforting and can be inhaled with a spoon at your desk. (It's just as nice cold, by the way). 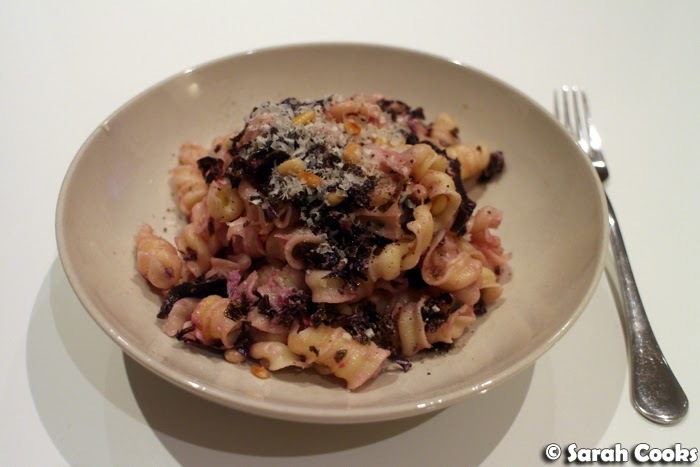 I thought of calling it: "Purple Pasta Salad" (ooh, alliteration! ), but the title I've gone with is more descriptive, so it won. Enjoy! Toast the pine nuts in a dry frying pan until golden brown and fragrant, then tip onto a cold plate and set aside. Put a large pan of water onto boil, salt generously and add the pasta. Boil according to packet directions. Drain and set aside. Meanwhile, heat the garlic oil in a large frying pan. Finely chop the onion and cook it in the pan with a pinch of salt until softened and translucent. Peel the kale leaves off the stems. Discard the stems and finely shred the leaves. Add the shredded kale to the fry pan, and cook, stirring often, until wilted down and cooked through. Add some hot water from the kettle if the pan gets too dry. Crumble in the feta, stirring until it is melted and combined with the sauce. Off the heat, stir in the grated parmesan cheese and pasta. Taste and add salt, pepper or extra parmesan cheese as necessary. Serve hot or at room temperature. This sounds awesome, especially with the feta and pine nuts. I only see red kale occasionally but will definitely have to keep an eye out for it now. I haven't bought into the kale hype yet...the concept of kale chips is vaguely appealing, but I just haven't gotten into it. Maybe this can convert me?